Visual notetaking is a skill I have coveted for some time, after watching a couple friends do it superbly. I thought this would be an excellent way to learn more about the process and begin to cultivate the skill myself. I was right! Mills offers a step-by-step introduction to visual notetaking, covering all the whys, hows, whens and whats. This is definitely a book for beginners who need to learn about tools as well as techniques. She is meticulous in detail, which is wonderful for beginners but a little pedantic for anyone who has even a little bit of experience with drawing and sketching. However, even though Mills exhorts the reader to read each chapter in order, it’s easy enough to skip the stuff you don’t need. The gold here is the advice and instruction Mills gives on *how* to take notes, especially the emphasis on listening and practicing. This will be popular with people exploring lettering and bullet journaling, but also with people looking for a new way to record and absorb information. There are people who love to read and prize the story above all else. These people will read anything – traditional printed books, e-books, magazines, comic books, and so on. Then there are others who love the form of the book as much as the words. These people love the feel and smell and heft of a book. They appreciate the font used to create the words, the paper used to create the pages, the color used to create beautiful endpapers or illustrations, and the art of the cover. A book is a book is a book. 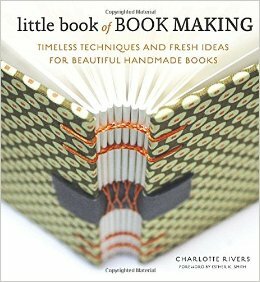 In the little book of BOOK MAKING by Charlotte Rivers, the art of creating a book is broken down into multiple types of processes that artists and crafters can use to create beautiful handmade books. Rivers begins by offering an “anatomy of a book” that illustrates and describes all the different parts of a book – signatures, endpapers, head- and tailbands, the case, covering, backing material, and spine. This simple illustration and accompanying text is useful for any beginning bookbinder and will be something a budding book artist will refer to again and again. Rivers then introduces the reader to a number of accomplished book binders and artists from around the world. Their featured work illustrates types of book creation such as folded bindings and includes intricate work from artists like Gabriela Irigoyen, Thereza Rowe, and Becca Hirsbrunner among others. Each page features a different artist, including photos and descriptions of their work. The same descriptive process is followed for chapters on sewn bindings and packaging. Rivers reserves the final chapter for “Bookmaking in Practice” where she gives the tools and steps needed to begin binding your own books. I nice set of illustrations and descriptions of necessary tools precedes instructions written by individual artists on how to make a variety of books, from an “Instant Book” to accordian, carousel, and dragon books. Also included are step by step instructions on various binding techniques such as pamphlet stitch, coptic stitch, long stitch, and Japanese stab stitch. Finally, instructions for creating a case binding, marbling endpapers, hand-dying paper, and creating cloth-covered boards are also included. While the drawn, illustrated instructions might put some people off, they work in this little book. The instructions are clear, and using photos of real artist bound books to demonstrate different aspects of book making helps makes this a handy guide for anyone interested in trying book making. Recommended for library collections and students. Vision Box Ideas by Mark Montano – I don’t usually like to review graphic-intense books such as graphic novels or art/crafting books in digital format because my past experiences has included pages that take F-O-R-E-V-E-R to load, and miniscule text rendered as PDF that is nearly impossible to read. I was pleasantly surprised, then, when I found Vision Box Ideas by Mark Montano very easy to read, with beautifully rendered images and clear text. I was not familiar with Montano when I started this book, but apparently he has some real arts & crafts cred, which shines through in this inspiring offering. Montano offers several examples of vision boxes centered around ideas such as travels and angels. He takes great care to let us know, though, that these are ideas that we should use as jumping off points for our own creative vision boxes. 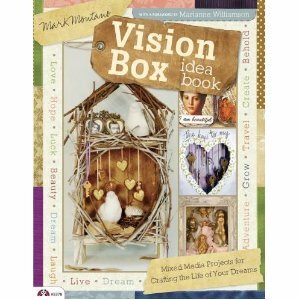 What is a vision box? Pretty much anything you can imagine. Think about what is special to you, what has meaning in your life right now, or what you envision in your life in the future. Then think about how to represent those visions visually. Finally, arrange all those visual representations into a 2 or 3 dimensional collage created inside a frame or box. I’m making a box right now centered around letter-writing using old letters from friends, beautiful stationery, photos, stamps, and unusual writing utensils. Montano is very clear and precise in his instructions, all the while reminding us that creating art isn’t done according to a blueprint – that each project has to have some of us injected somewhere. He shows us how to create his boxes exactly, if we want to, but he also pushes us to change a little bit here, or add a little bit there, to create something unique.